One of my favorite decks from last year was a Cinccino/Hypno deck that me, and Adam Biggott (Pokebro on Youtube) helped to popularize. I had written a Six Prizes article on the deck before Spring Regionals last year (Dusting Up Regional Championships With Cinccino), and Adam made a very good deck profile video on the deck. The idea behind the deck was to flip well with Cinccino, creating an invincible Pokemon that had the potential for your opponent to never knock out. Cinccino NXD has an Ability called Smooth Coat, that allows you to flip a coin, and if heads, your opponents attack on Cinccino does no damage. What made this concept work is that Cincinno actually had a strong attack as well in Echoed Voice. Echoed Voice does 50 damage the first turn you use it, and then 100 damage on each consecutive turn that you use the attack. If you get a Cinccino that stays alive for back to back 100 damage attacks, you are able to 2hko any EX Pokemon in the format. To maximize the chances of your Cinccino staying alive, you would play Hypno HS and use its Sleep Pendulum Poke-Power in an attempt to put your opponent’s Active Pokemon to sleep, of course hoping that they flip tails on their sleep flip heading into their turn, preventing them from attacking. This would lock your opponent’s Active Pokemon in the active spot, as you also played Vileplume UD to prevent your opponent from Switching as well as to give you some bench protection. My version of the deck also played Shaymin EX as a late game sweeper. You could easily setup Shaymin EX behind the protection of Vileplume, and force your opponent into an odd prize exchange that they could not win, especially when they were playing a deck without any non-EX attackers. This made for a cute little deck that actually was able to pack a powerful punch, with the caveat that you needed to be able to flip somewhat well to keep your Cinccino’s alive long enough for them to do big damage. The deck didn’t need to flip all heads or anything like that in order to win, but just often enough to gain an advantage on your opponent. The deck actually ended up taking home a first place finish at a Battle Roads in a tough Florida meta game during the Spring. You can check out that player’s report here. Unfortunately the great Cinccino/Hypno deck was one of the decks that fell victim to the rotation, as Cinccino’s good buddy Hypno rotated out of the format, as well as their protector Vileplume UD. However, when the scans of Freeze Bolt and Cold Flare were released, a card caught my attention from those sets that could revive this great concept – Munna. Munna has an Ability that has the potential to put your opponent’s Active Pokemon to sleep, which allows for the recreation of this particular Cinccino archetype. The new version of the deck will of course be nowhere near as strong as the original, but the new challenges that will come in recreating the deck make it just as fun, or possibly even more fun of a deck to play. First, let’s take a look at the deck that started it all. Here is my list for the original Cinccino/Hypno deck from last format. As you may come to realize, this deck features a lot of cards that have rotated out of the format, 25 cards in total, which means the new version of the deck is going to be very different from the old version of the deck. In this section, I just want to highlight the biggest losses for the deck. Hypno – This was the original status infliction partner to be paired with Cinccino. 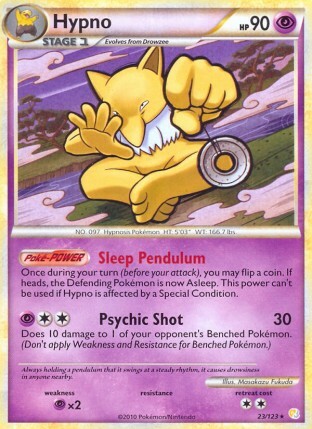 Its Sleep Pendulum Poke-Power came with no drawbacks, and allowed you to put your opponent’s Defending Pokemon to sleep in attempts to stall your opponent and lock their Pokemon in the active position, while also buying some easy turns of keeping your Cinccino alive. Hypno is replaced in the new version of the deck with Munna, which isn’t quite as good to say the least. Vileplume – Trainer Lock was a big part of what made this deck work so well, and that is what Vileplume provided the deck with its Allergy Flower Poke-Body. With trainer lock in effect, your opponent could not Switch their sleeping Pokemon out of the Active Spot and your opponent also could not use Catcher to reset the additional damage from Echoed Voice. Additionally, this prevented your opponent from searching out more Pokemon or using Dark Patch to setup more attackers, causing their deck to kind of stall out depending on the deck. It also allowed you to setup Shaymin EX safely on your bench as a late game sweeping option. Rescue Energy – This card worked really well with the deck allowing you an easy way to get another Cinccino to evolve into, allowing you to keep a steady stream of Cinccino coming all game long. This card can be replaced by Rescue Scarf in the new version of the deck. As you probably know, there is no replacement from Vileplume’s Allergy Flower Poke-Body, which means that the new version of the deck will be a non-Item lock variant. This opens up the possibility of your opponent countering your deck with Switch, as well as resetting your Echoed Voice attack with Pokemon Catcher and possibly taking easy knockouts on your vulnerable benched Pokemon. Nonetheless, I think the deck concept is an amazingly fun one, so I will walk forward with Cinccino into the new format. Before moving forward with the list for this deck, I would just like to say that it was a struggle to cobble together a list that was satisfying to me, but by the power of Arceus I somehow managed to put together something that I find decent enough for the deck. Now, to take a look at some of the card choices and the reasoning behind them. Virizion – This is the ideal starter for this deck. Its Double Draw attack gives you some early draw to help aide in your setup, which admittedly, isn’t all that complex of a setup, as you are just need to get a Stage 1 attacker setup along with a Basic support Pokemon. Virizion can also serve as a good early game attacker against Eelektrik and Blastoise decks, as Leaf Wallop ohko’s both Tynamo and Squirtle. Most importantly, Virizion serves as a buffer to Landorus EX and Mewtwo EX in the early game, as Minccino is easily donked by Landorus EX because of its Fighting weakness and Munna is at risk of being donked by Mewtwo EX because of its Psychic weakness. Virizion is a nice bulky Pokemon that can take some hits while you get your setup going. Munna – This is new status inflicting Pokemon in the deck, replacing Hypno. 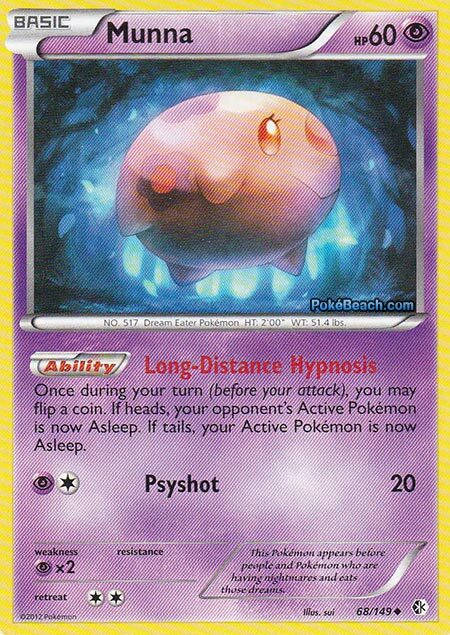 Munna is a Basic Pokemon with an Ability called Long-Distance Hypnosis, which states, “Once during your turn (before your attack), you may flip a coin. If heads, your opponent’s Active Pokemon is Asleep. If tails, your Active Pokemon is now Asleep.” That’s right, Munna has the horrifying drawback of also being able to put your own Active Pokemon to sleep, which makes it quite worse than Hypno was in the old version of the deck. There are some ways that this can be played around (like flipping heads over and over again! ), but all in all, this drawback is one of the things that makes this deck so fun to play with, as you never know what could happen with this deck, good or bad. 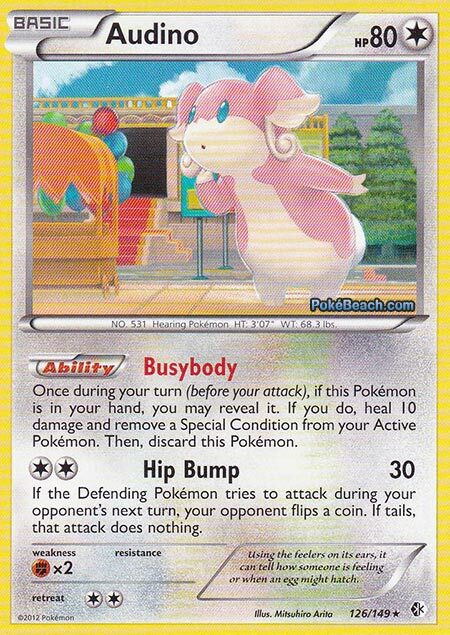 Audino BC – This card has an Ability called BusyBody, which states, “Once during your turn (before your attack), if this Pokemon is in your hand, you may reveal it. If you do, heal 10 damage and remove a Special Condition from your Active Pokemon. Then, discard this Pokemon.” Audino can be played in place of or in conjunction with Full Heal for removing the effects of a Long-Distance Hypnosis gone awry. 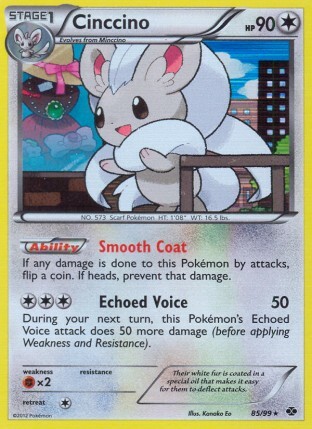 This card seems to have been made with the Cinccino/Munna combination in mind. It has an Ability that undoes the effect of a bad Munna flip, but its attack also fits in with the general strategy of the deck, which is making your opponent’s attacks worthless. Its attack, Hip Bump, does 30 damage and if the Defending Pokemon tries to attack on your opponent’s next turn, your opponent has to flip a coin, and if tails, their attack does nothing. Perhaps this card is the right play in the the deck over Full Heal just because of this little bit of extra synergy it has with the deck?…maybe. It is some good tasting feng shui after all. The benefits of playing Audino over Full Heal are that Audino can be searched out by both Level Ball or Pokemon Communication (which can both be searched out by Skyla), giving you more outs for Audino than you have for Full Heal. Additionally, if you play 3 Audino in your deck, you have the potential to use Audino up to six times in any given game with my list as you are able to get back Audino with Super Rod. Lastly, Audino can be used under Item-lock by your opponent. Shaymin EX – Shaymin still acts as your late game sweeper. All of your other Pokemon only give up one prize, so in most circumstances, you will be able to force your opponent into an odd prize exchange, which you can work to your advantage as you begin Revenge Blasting their field with Shaymin EX. The Supporter Engine – What I went for in this Supporter Engine is one that never discards any cards from your deck as all of your resources are pretty vital. I chose to only play 12 Supporters as I find that to be a comfortable number in conjunction with the additional draw that the deck has in Virizion’s Double Draw attack. 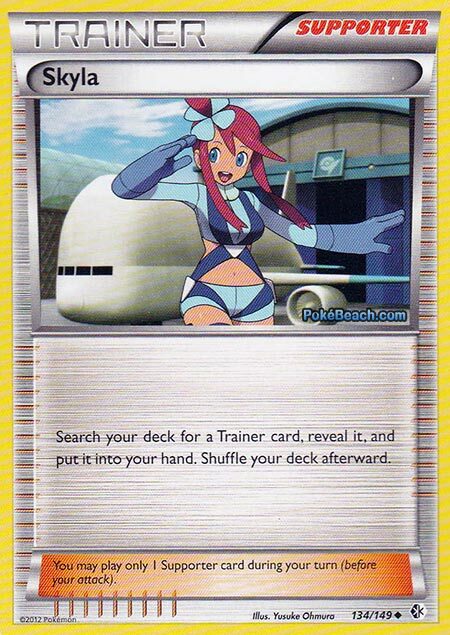 I think this is one deck in which Skyla can really shine. There are so many situations in which you will need one specific card, and Skyla allows you to get that card with ease. Need a Pokemon Catcher to take an easy knock out? Skyla is there to search that out for you. Flip tails on Long-Distance Hypnosis and need an Audino to give a wake up call to your Cinccino, Skyla is there for you once again. Need that tech Energy Switch to setup your Shaymin EX in one turn? Skyla is there for you once again. As you can probably see, Skyla is ALWAYS there for you. She is a very awesome Supporter, and much better than that evil Bianca that likes to screw you over time and time again! Rescue Scarf – This fills the role of Rescue Energy in the old version of the deck. It allows you to put your Cinccino back in your hand giving you easy access to evolving into another Cinccino to keep a steady stream of them coming. Aspertia City Gym – This is one of the new Stadium cards in the format, and it adds 20 HP to all Colorless Pokemon. This is a tech that I think works really well in the deck, as most EX Pokemon only hit in the 90-100 damage range. Turning Cinccino into a 110 HP monster allows it to live, even if your opponent happens to break through your Smooth Coat shield for a turn. Additionally, other Colorless Pokemon haven’t been seeing too much play, so the likelihood of this helping out your opponent as well is very slim. The only Colorless Pokemon active in the meta game are Tornadus EX and Bouffalant DRX, and even those aren’t all that well played at the moment, so in most matchups, you will be the only one benefiting from this Stadium Card. Cinccino BLW – This Cinccino would give you a strong turn 2 attacker which could potentially gain you a very early prize lead. As long as you have a full bench, its 100 damage with Do the Wave is guaranteed, while the other one needs to use Echoed Voice for consecutive turns to be hitting for 100 damage. The weakness of this one is that it does not come with the potential for invincibility like the Smooth Coat Cinccino. Tool Scrapper – As this deck is heavily reliant on Abilities, it would only be natural that the deck would struggle with Garbodor variants. As this is a fun deck, I don’t think it is worth it to use a spot in the deck for a tech card for competitive play. However, this card is also useful in removing Eviolites to keep your opponent’s Pokemon in 2hko range for 100 damage Echoed Voices. Full Heal – This card can be used in place of Audino or in conjunction with it as another way in which you can remove the effects of a bad Munna flip. The benefits of playing this over Audino are that it increases your probability of starting with Virizion, your ideal starter. Unfortunately, replacing the Audino with three Full Heal only increases the probability by ~4%, which isn’t enough to warrant playing this card over Audino with all the advantages that come with Audino. This deck probably won’t win any tournament ever (although they said the same thing about its predecessor Cinccino/Hypno, and that won a Battle Roads! 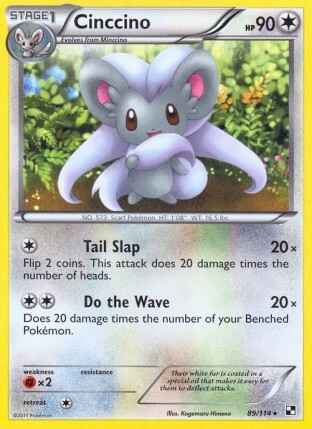 ), but Cinccino is back to claim its spot in one of the most fun decks that the new format has to offer. I mean, what’s not to enjoy about this deck? You have the possibility of creating an invincible Cinccino that steamrolls through your opponent’s field. You have Munna’s hilarious sleep flips, which can backfire on you by putting your own Pokemon to sleep, and then your deck is built around using Audino to clean up the possible ill effects of Munna’s Ability. What’s not to like about this fun little mess of a deck? Once the new set is released on PTCGO, I will work on obtaining all the cards needed for the deck and then record some matches using it, so look forward to that in the coming weeks.